So many things have changed since having a baby (not just my figure). My car used to be my place to escape from reality. Where I would sing along to loud music and not care who saw me through the windows. I have no shame, I don't care what my singing sounds like (although inside my head it sounds awesome, just saying). Since having bubs my car is no longer an escape. A car trip now requires planning with military precision. How can one tiny person require so much stuff just to leave the house? There's food, nappies, wipes, dummy, toys, wraps to be packed before we even walk out the door. Then the spare food, nappies, dummy, wrap and toys - incase the first ones are involved in an unfortunate accident that involves vomit (or poo). Fortunately I can fit all of that and my own things into the nappy bag so I don't need 8 arms to get out the door. Once we've finally got to the car and wrangled folded the pram into the boot and shes strapped into her seat, then the real fun begins. There is no longer any loud music and enthusiastic singing emanating from my car. These days it's filled with the sounds of a crying baby and the jingling of car toys. The majority of our car trips are spent reassuring her that everything is ok. I have resorted to you-tubing the giggle and hoot theme song on more than one occasion when she's in the middle of an epic tantrum (when I wasn't the one driving). I'm not yet at the point of buying childrens cds to play in the car, so for now my stereo is still my own property. She has however taken over the rest of the car. It's not unusual to find a stray dummy or squeaky toy lurking around the back seats or boot. And inside the house, well she's pretty much taken over that too. There are bits and pieces of baby paraphernalia in almost every room of the house. The lounge has been converted and now resembles a baby emporium. She has her own play corner with every toy a girl could want (and a couple that mummy wanted). The kitchen cupboards house the baby food processor, tins of formula and the steriliser. The fridge is full of bottles and the freezer is overflowing with baby food. There are little reminders of her everywhere I turn and I wouldn't have it any other way. There is one thing I wish I could change though, and thats the amount of cleaning that I do. It seems even though I clean a hell of a lot more often than I used to, everything manages to get dirty again at a rapid pace. It goes on and on day after day. So, I must confess if there was one thing I would outsource as a mum, it would be the cleaning. However, in reality I know that wouldn't happen. I'm one of those people who would need to make the house spotless before the cleaner arrived, just so they didn't realise how messy it really gets. So, for now I am happy to muddle through my motherhood journey day by day as it is now. Squeaky toys, car tantrums, monotonous cleaning routines and giggle and hoot included. and Kirsty for I Must Confess. It is hard some days, but playing and laughing with her is a lot more fun than dusting or folding laundry. We just took out our dining table to give her a bigger play corner and I thought wow our house is bigger than I thought. When you take out all the adult furniture and replace it with floor height baby things you can't help but notice the floor space lol. 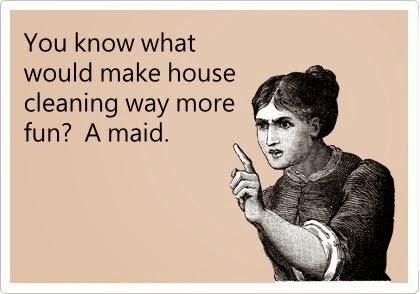 Ha ha, a maid certainly would make cleaning a whole lot more fun! I say enjoy your baby and don't stress over it. It goes so fast. I've worked out the perfect solution - if T would just work out how to clean then he could be the maid! I want to replace my entire couch, but I figure theres no point in even contemplating it until shes out of primary school.. Sometimes the messiest times are the most fun! I'm loving trying new food with her, the faces are hilarious. My car, my stereo. My kids never got kid music and have been subjected to house music since they were in the womb. Turns out they are both really good dancers which I give myself credit for, it makes me proud that they can sing both Santogold's album and Blur's Parklife off by heart, bless 'em. My three year old can also recite "Eye of the Tiger" by Kitty Purry but I hold commercial radio responsible for that! She loves techno music, thankgod because I am never giving that up. I imagine we will dance along to it together once she can walk so I'm hoping I will avoid kids cds in the car. Oh I hear you and it's taken me a very long time to accept mess and get on with it, but, I do have to do one good clean up a week to keep myself happy. I always think back to a saying that goes something like 'a spotless house is the sign of a wasted life'...and that's very true. I kind of cheat and just clean the rooms that we use most. The ones I don't go into that often are kind of out of sight out of mind (whoops). Yep no nice things including a house for mummy ever! i realised this years ago when it occurred to me i walk out of a clean room to clean another whilst i do that a child or husband is in that room messing it up! Exactly! What makes me so annoyed is the fact that it takes me like 2 hrs (in 15 min bursts) to clean up and about 5 mins for them to mess it up again. You've definitely hit the nail with this description. And not to forget the laundry! It's amazing how much laundry a little person can generate. Phew! Yea most of the washing I do now is for her! Mr 4 had reflux as a baby so I can definitely relate to the piles of clothes you seem to have to take out with you. They always seem to pick when you are out to one of those awesome number 3's too! My life has definitely changed since he was born. I wouldn't change it for the world though. Yes she definitely has perfect timing with the vomiting and poos! I don't really mind the giggle and hoot theme song either (but keep that on the down low). I would also be the type to clean up before the cleaner. Embrace the mess factor and concentrate on your little one they grown up too quickly. I've embraced the mess, but I do stress out when I know people are coming over. I'm slowly learning to relinquish control over the mess. I like to think I'd clean before the cleaner, but I know myself too well and cannot lie. I try and keep the house reasonably tidy but it is so hard with 2 boys and a dog, not to mention a teenager and a husband who works from home. I guess our standards just adjust as they need to. I'm sure you have a lovely singing voice just like me, and now you get to sing lullabys as well! Oh yea I'm sure someone somewhere would think my voice was as great as I do! I already know the theme songs to most abc shows and I have been known to make up lullabys when I can't get her to sleep and am too tired to remember the real words. They really do take over every corner of your life don't they? My kids hated music at first. But now they love it. I've also tried to make my bedroom a toy free zone..though they keep creeping back in. Just so I have some little piece of sanctuary. I think you are in complete denial about just how much your life is going to change!!! Until it does..... I have always played loud music though....my girls are used to it now!! !